Our new “To Go Café” at Reesor’s Market & Bakery is open 8:00 am to 3:00 pm Mon. to Sat. 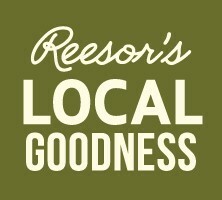 Reesor’s Market & Bakery, Main St., Stouffville now opens one hour earlier at 8:00 am from Mon.-Sat. So, you can pick up one of our new, delicious espresso-based drinks, a warm panini made on our own bread, grab one of our new brown bag lunches and do your grocery shopping all on the way to work. We’ve created delicious new sandwiches that we grill to order in our panini press. Try turkey, cranberry and goat cheese; egg, ham and cheddar; or a flavourful Reuben panini. There’s quiche by the slice, lasagne, King Kale Salad, Mighty Caesar Salad and more! We’re looking forward to serving you. We’re here to help you make your dinners and parties delicious. Cookie trays, soups, quiches, tourtières and our huge selection of frozen and fresh entrees such as lasagnes and chicken pies let you enjoy your own parties or make pot-lucks more fun for you. Here is our Christmas baking list. Check our fresh entree fridge for heat and serve meals that change daily. Keep frozen soups, lasagne or butter chicken on hand, so your family can sit down together for a good meal and you’ll have renewed energy to go Christmas shopping after dinner! Here’s a fast and fun way to get the taste of classic lasagne on the table without the fuss of layering and baking. You start with canned tomatoes, sausage and pasta to make the soup. Then put a spoonful of ricotta cheese in each bowl, add the soup and then broil the cheeses on top of the bowls of soup. Customize the soup according to your own taste by using your favourite sausage, adapting the cheeses or try one of the many gluten free pastas we offer at Reesor’s. Bring a large pot of salted water to a boil. Add the noodles and cook as the label directs. Drain; drizzle with a little oil and toss to prevent sticking. Meanwhile, heat 1 tablespoon oil in a large Dutch oven or heavy-bottomed pot over medium-high heat. Add the onion and cook, stirring, until softened, about 4 minutes. Avoid browning the onion. Add the sausage, garlic, oregano and basil and cook, stirring and breaking up the sausage with a wooden spoon, until the sausage is browned, about 5 minutes, until no longer pink. Drain any fat if necessary. Add the tomato paste and cook, stirring, until darkened, about 2 minutes. Add the chicken broth, tomatoes and 1 cup water; cover and bring to a simmer. Uncover and cook until slightly reduced, about 20-30 minutes to blend the flavours. Stir in the noodles and simmer 2 more minutes. In a bowl stir together the shredded mozzarella and the grated Parmesan. Spoon a tablespoon of ricotta in the bottom of each soup bowl. Divide the soup among bowls, pass the grated cheeses and let the soup melt the cheeses. Preheat broiler and place oven-safe bowls on a baking sheet. Spoon ricotta, and ladle soup into bowls and top each bowl with the Parmesan and mozzarella blend. Place under broiler with oven door cracked for 3-5 minutes until cheese browns, watching carefully. Let cool for a few moments before eating. What do our bakers & cooks shop for at Reesor’s?